Whether Trump likes it or not, it's in the best interests of all NATO allies to stay united in the face of potential threats, from Russia and elsewhere. 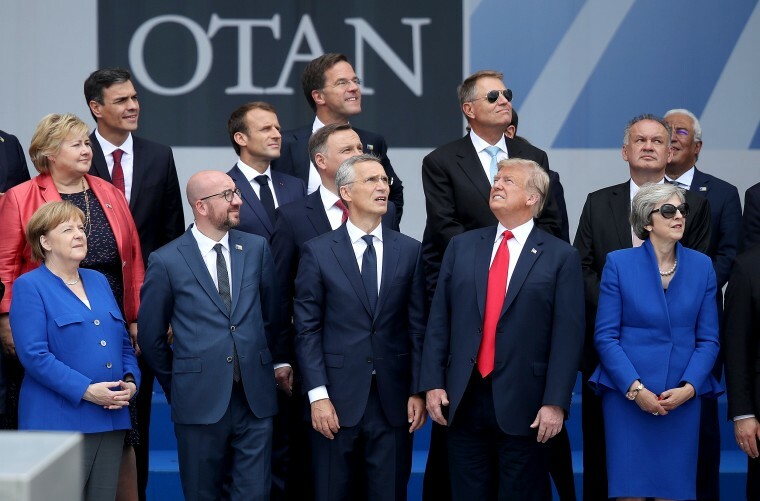 President Donald Trump clearly doesn’t care much for NATO. Alarm bells went off when Trump said his upcoming meeting with Vladimir Putin would be easier than those with NATO members and UK leadership. The indictments of 12 Russians charged with hacking the Democratic National Committee and Hillary Clinton’s emails during the 2016 presidential campaign reaffirm the security concerns Russia poses — concerns NATO was originally designed to address. Simply put, Trump’s boorish display in Brussels on July 11 was a highlight reel of horrible. Trump went as far as to say that U.S. allies are “delinquent” on payments they don’t, in fact, owe. He also claimed that Germany was “captive to Russia” because of its Russian oil and gas imports and a proposed natural gas pipeline. While Trump’s statements suggest he might prefer Putin’s friendship over those of U.S. allies, little has changed in terms of actual U.S. policy. However, what first was strategy now is farce. The indictments of 12 Russians charged with hacking the Democratic National Committee and Hillary Clinton’s emails during the 2016 presidential campaign reaffirm the security concerns Russia poses. It’s hard not to feel like the sky is constantly falling thanks to the unpredictable and frequently incompetent nature of the Trump administration. However, concerns about increasing European defense spending go back to Richard Nixon, who reached agreements with West Germany and other partners to help cover the cost of stationing troops in Europe. Similar stances with some variation have been taken by basically every administration since. Washington has long sought more spending from its NATO partners because U.S. military doctrine has required the U.S. to be able to fight multiple wars simultaneously ever since World War II. And the U.S. is itself capable of deploying large forces in case of multiple conflicts, providing a broad security umbrella or presence across much of the globe. In exchange for the ironclad guarantee that the full weight of the U.S. military is available should it be necessary, NATO allows the U.S. to station troops and assets in Europe in support of missions within Europe as well as in the Middle East and Africa. U.S. forces also provide a clear deterrent. If Russia or any other state were to invade a NATO member hosting U.S. troops, the U.S. would have to respond because they’d be in harm’s way. Past administrations have always assumed NATO to be a crucial component of U.S. security. Thanks to Washington’s outsized role in defense, partners can focus and specialize their capabilities — something that’s more important than arbitrary spending increases — so as to multiply the value of what they spend. Further, the alliance guarantees no European state undertakes a unilateral arms buildup to fight its neighbors. In short, NATO secures a peaceful Europe and helps the U.S. maintain security and project power elsewhere. Sadly, the Trump administration has repeatedly spurned multilateralism, preferring to negotiate one-on-one and treat NATO as if it were an extortion racket. Critiques about spending are fair, but NATO members have begun spending more relative to the U.S. since NATO’s Wales summit in 2014. And indeed, though many fear Trump’s lack of commitment to European defense, U.S. spending in Europe has risen too. Trump’s complaints about Germany’s subservience to Russia also have historical precedent. Back in 1982, the Reagan administration imposed sanctions on western firms’ participation in a proposed natural gas pipeline project from the Soviet Union to western Europe via western Germany. It was argued that allowing the Soviets to sell natural gas to allies would threaten security and undermine the alliance from within. European allies pushed back, forcing the U.S. to compromise. NATO wasn’t particularly threatened by that controversy then. Today, Germany imports most of its natural gas from Russia. But it’s of limited value for Russian influence. After all, German Chancellor Angela Merkel has led Europe in sanctioning Russia for its actions in Ukraine. And concerns about the proposed Nord Stream II pipeline — a pipeline running through the Baltic alluded to by Trump — are largely exaggerated. The pipeline changes relatively little for Europe’s energy security and Russia isn’t the Soviet Union. The real concern is what happens to Ukraine, which collects revenue from Russia’s shipments of gas via its pipelines. Trump’s opposition to Germany’s participation in Nord Stream II fits with traditional U.S. policy, whether or not he’s serious about his more outlandish criticisms. That should ease fears that he will make concessions about Ukraine for Russia’s benefit but confirm he’s willing to shred diplomatic relationships with key U.S. allies for unclear gain. In the end, Trump’s incendiary comments about NATO are deeply rooted in traditional American policy concerns. Where he differs is the packaging and the incoherence of his administration. Escalating trade fights and abandoning the Iran deal has put the U.S. at odds with European partners. Blatant disrespect for them and their interests is a recipe for political isolation over time. Despite his nonsensical talk of a 4 percent of GDP spending target, NATO agreed to a $33 billion spending increase. With several years left in his first term, this president has already stretched old tropes in transatlantic relations to their limits through his disinterest in facts and lack of finesse. With several years left in his first term, this president has already stretched old tropes in transatlantic relations to their limits through his disinterest in facts and lack of finesse. Where previous administrations understood that they could achieve concessions and assurances through steady diplomacy, he’s made such diplomacy impossible. Subordinates handling talks run the continuous risk of being undercut by an uninformed tweet or the childish annoyance Trump displayed in Brussels. American credibility is constantly undermined as an unnecessary negotiating tactic. Technically, Trump could pull the U.S. out of NATO at any time. But his complaints are just farcical versions of long-standing U.S. concerns that appear tough. U.S. policy isn’t changing. In fact, NATO General Secretary Jens Stoltenberg said Georgia, a country Russia invaded in 2008, will become a member, affirming its Euro-Atlantic aspirations more strongly than in the past. NATO is set to build a new base in Romania, a blow to Russia’s interests, and also extended an offer of membership to Northern Macedonia. Trump is set to meet Putin on Monday in Helsinki and most people, understandably, are worried about what could happen. Fortunately, U.S. policy is unlikely to change very much since Trump doesn’t seem all that concerned with the nitty gritty of governance. At the end of the day, the U.S. still needs NATO just like NATO still needs the U.S. And whether Trump likes it or not, his own Justice Department’s announcement last week reinforces to both the American public and U.S. officials why it’s in the interests of all NATO allies to stay united in the face of potential threats, from Russia and from elsewhere. Nick Trickett is the editor-in-chief and associate scholar for the Foreign Policy Research Institute's BMB Russia, a daily news brief and blog covering Russia's politics and economy as well as post-Soviet states. He writes regularly on the political economy of Russian foreign policy. Nick Trickett is editor-in-chief and associate scholar for the Foreign Policy Research Institute's BMB Russia, a daily news brief and blog covering Russia's politics and economy as well as post-Soviet states. He attended Haverford College and received a master's degree from the European University in St. Petersburg and writes regularly on the political economy of Russian foreign policy.